“Without dreams we would be cows in a field and I don’t want to live like that. 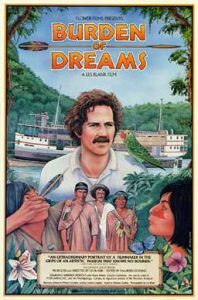 I live my life or I end my life with this project.” Les Blank’s riveting documentary focuses on the utter chaos surrounding the filming of legendary German director Werner Herzog’s 1982 epic, Fitzcarraldo, in the jungles of South America. Whether having to replace his entire cast (the film originally starred Jason Robards and Mick Jagger! ), attempting to drag a 320-ton steamer over a small mountain or trying to deal with totally insane actor Klaus Kinski, Herzog reveals an unwavering obsession to finish his film. At one point, Herzog remarks, “I shouldn’t make movies anymore. I should go to a lunatic asylum.” Roger Ebert called Burden of Dreams, “one of the remarkable documentaries ever made about the making of a movie.” Burden of Dreams would make a great double feature with My Best Fiend, Herzog’s fascinating 1999 documentary about his turbulent relationship with Kinski. Blank (1935-2013) also directed Werner Herzog Eats His Shoe (1980), which documents Herzog honoring his bet to eat his own shoe if Errol Morris ever completed Gates of Heaven (1978), an offbeat, critically acclaimed documentary about a pet cemetery.